I purchased this plant at the 2007 Gesneriad Society convention in Miami. It was very striking because the leaves differed from those of other sinningia-clan species, and particularly from all other vanhouteas that I was familiar with. 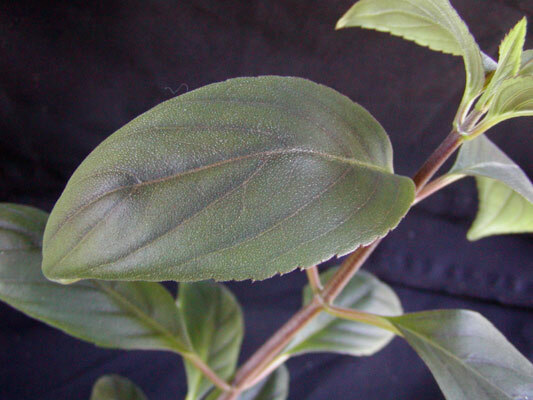 The leaves are dark green with a reddish tinge. In my plants, I see red only on the top of the leaf, not on the underside. I have pinched out the growing tips of this plant several times, hoping to get shrubbier growth. Each time, the plant put out two new shoots from the node directly below the pinch point. It did not branch from nodes further down the stem. From this I conclude that in order to get a full bushy plant, one has to begin the pinching regime very early and not allow the plant to develop long stems. We will see how that works out. Update [March 2009]: The plant which spent the winter outdoors is now putting out new shoots from almost every node, without having been pinched back. Perhaps the plant will do this only in the spring, or only after a cold spell. Feature table for Vanhouttea sp. "Venda Nova"
Inflorescence Axillary cyme, usually one flower per axil, judging by the picture on the Brazil Plants web site (see link below). From seed No information yet. Hardiness Has survived 30 F (-1 C) without damage (January 2009). Recommended? Too soon to tell, but the leaves are attractive. Taxonomic group I don't know. Mauro Peixoto's web site has information and a picture.